Our program is intended for people willing to achieve their financial freedom but unable to do so because they're not financial experts. fastream.biz is a long term high yield private loan program, backed up by Forex market trading and investing in various funds and activities. Profits from these investments are used to enhance our program and increase its stability for the long term. 14.11.18 06:45 Transfer Sent Payment: 60.00 USD to account U18098541 from U1294xxx. Batch: 235915659. Memo: Shopping Cart Payment. 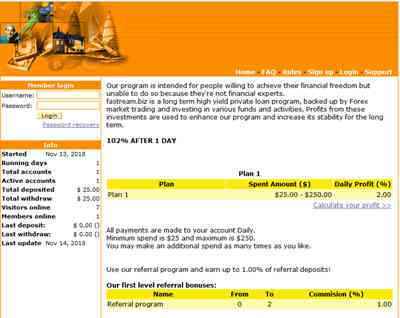 Deposit to fastream.biz User allhyips. 15.11.18 16:59;Account;Receive;Received Payment 1.45 USD from account U18098541 to account U1294000. Batch: 236108715. Memo: API Payment. Withdraw to allhyips from fastream.biz. 16.11.18 17:08;Account;Receive;Received Payment 1.2 USD from account U18098541 to account U1294000. Batch: 236225654. Memo: API Payment. Withdraw to allhyips from fastream.biz. 17.11.18 16:43;Account;Receive;Received Payment 5.00 USD from account U18098541 to account U1294000. Batch: 236327507. Memo: API Payment. Withdraw to allhyips from fastream.biz. 18.11.18 04:13;Account;Receive;Received Payment 1.2 USD from account U18098541 to account U1294000. Batch: 236365976. Memo: API Payment. Withdraw to allhyips from fastream.biz. 19.11.18 18:26;Account;Receive;Received Payment 1.45 USD from account U18098541 to account U1294000. Batch: 236567597. Memo: API Payment. Withdraw to allhyips from fastream.biz. 20.11.18 19:33;Account;Receive;Received Payment 1.45 USD from account U18098541 to account U1294000. Batch: 236702944. Memo: API Payment. Withdraw to allhyips from fastream.biz. 22.11.18 04:09;Account;Receive;Received Payment 1.2 USD from account U18098541 to account U1294000. Batch: 236853465. Memo: API Payment. Withdraw to allhyips from fastream.biz. 23.11.18 05:39;Account;Receive;Received Payment 1.2 USD from account U18098541 to account U1294989. Batch: 236984017. Memo: API Payment. Withdraw to allhyips from fastream.biz.